Google is testing a new feature of "Quick View" for Wikipedia pages. 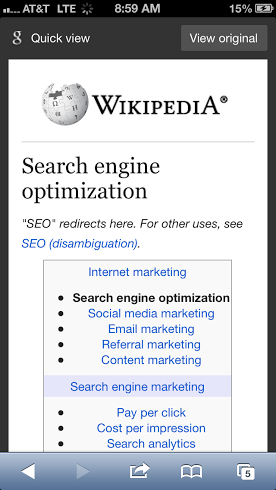 This feature would enable us to view a lighter version of the Wikipedia pages after we click on a blue button displayed next to the Wikipedia search results displayed related to the search query. The Quick View button is still in the testing mode and is currently available for Wikipedia pages only. May be in future this would be available for all the websites. It is worth mentioning here that Wikipedia has ready been included in the Google Knowledge Graph and this is the second time it's included in a vital new feature known as Quick View.